"Magpie's Mumblings' is an independently operated blog run by me (Mary Anne Richardson) and within I share my creative work (various crafts, quilting, embroidery, crazy quilting) along with the occasional tutorial, recipe and photos of said work. I am the owner, creator and only administrator of this blog. I do not sell items through this blog. This blog is written by me and if I share a link to any other person's work/pictures/articles I clearly state the proper link to said work. Through your use of those links I am not responsible for the privacy policies of other websites or the applications they use. My computer has a running up-to-date anti-virus program in place at all times. It is definitely family friendly and there is never any questionable content shared here. If I notice any such activity attempting to be shared through the comments, it will immediately be deleted and, hopefully, through having my comments set to require moderation prior to publication, any such efforts will be thwarted. - if you leave a comment on the blog your email address could possibly be shared with me (and with me only) in order that I am able to respond to your comments. - it is possible that Google Analytics collects data, but those circumstances are beyond my control. Please visit THIS link to learn more about Google Analytics. - Your email and name are never sold by me or in any way shared with any third parties. Never. - As stated above, this blog is family friendly. By law, if you are under 16 years of age, you must have parental permission before using this blog site. You have the right to know how your personal data is being processed. Hopefully the policy I have outlined above will adequately explain how your data can be used. OK, folks - as promised I would let you know what I found out regarding the new privacy laws that seem to be upsetting the blogging world. I still don't understand it, despite doing a lot of extensive reading on the subject, but as near as I can gather it appears we are supposed to post a form of disclaimer on our blogs stating that we are not maliciously gathering private information from people. As if the majority of us are the least bit interested in such things, but the powers-that-be seem to think we should be. So....it pretty much boils down to having to post something on your blog stating that fact and assuring people (who you KNOW aren't going to bother reading the information anyway....ahem) that we aren't out to stalk them. If you check out the following link you will find a template that can guide you through what needs to be said (of course it has to be tweeked to suit your particular circumstances). Thank you Kim for finding this!!!! PLEASE NOTE: I am unable to make this link 'live', so you will need to cut and paste it in order to view it. I hope to have time this afternoon to tweek the template to suit my blog and will post it when I do. As a further note, it appears upon checking the help forums on Blog-grrrr, that they are working on any further issues that have come up. And, might I appeal to those of you who have your blog set to give you the ability to reply directly to comments ON your blog (without having to post a completely new comment), to give me some idea of what settings I need to use on my dashboard in order to allow that function? For the life of me I can't find it!! Okay folks - it seems that the Powers That Be (those that like to complicate our lives beyond all reasonable expectations) are monkeying about with our blogs and how they work. It appears that something is happening with the European Union called the GDPR. I don't know about you, but I haven't a clue what they're blathering on about. I've read a number of things about it, but unless you're fluent in computer-eeze it's all as clear as mud. If you understand it and know how to deal with it using Blogger I'd sure appreciate a tutorial in language that makes sense. If you would/could email me that and give me permission I'd love to share it on my blog so others could make sense of it too! (marmic1954 AT hotmail DOT com). In the meantime, the thing that seems to be affecting me most at the moment is that your comments are not showing up in my email box, which is where I am able to answer you easily. I haven't yet figured out how/if I can answer directly on my blog (I know some bloggers do) and although I don't like having to do it that way because it means an extra step for you, it appears it might be my only option. So.....if you don't receive responses to your much appreciated (and very anticipated!) comments in the manner to which you're accustomed, please forgive me....and blame those idiotic Powers That Be!!!! H - E - L - P ????? EDITED TO ADD: I cannot, for the life of me, figure out how to respond individually to your comments directly on my blog without having to post a whole new comment that then doesn't link directly to YOUR comment. I hate this!!!!!!!!!!!!! Until I get this figured out, please know that I AM getting your comments, I AM reading them, and I AM appreciating them. I have my blog set so that I have to moderate comments in order to avoid all the spam I keep getting, so if it takes a bit for your comment to show up, that will be why. Anybody know how to fix the commenting issue??? This quilt measures approx. 28"x20" and is for sale. If you're interested, please contact me! - There are a number of free bag patterns available HERE. - If you like knitting toe-up socks, perhaps the formula found HERE might be of use. - THIS is a rather cute little bag pattern that would have multitudes of uses. - I'm not sure what I feel about the work of THIS artist. It's interesting but as I said, I'm not sure. - If you happen to like bugs, perhaps THIS pattern might intrigue you? Or perhaps THIS one? Or THIS , THIS or THIS? Another anonymous quote..."Be thankful for all the troubles that you don't have"
Yes, I AM stitching but nothing quite ready to show at the moment, so how about showing you another piece of my special china. This also belonged to my grandmother; it's obviously hand-painted and is very fine china. There are no markings on the bottom of the cream pitcher, but the sugar bowl is labeled 'Austria'. Beyond that, I know nothing about it. - THIS is a really cute pieced teddy bear quilt block pattern. You can see the completed quilt HERE. - THIS is another intriguing pattern (This shows it completed). Unfortunately the actual pattern isn't there, but I think it's a variation on 'Storm At Sea'. 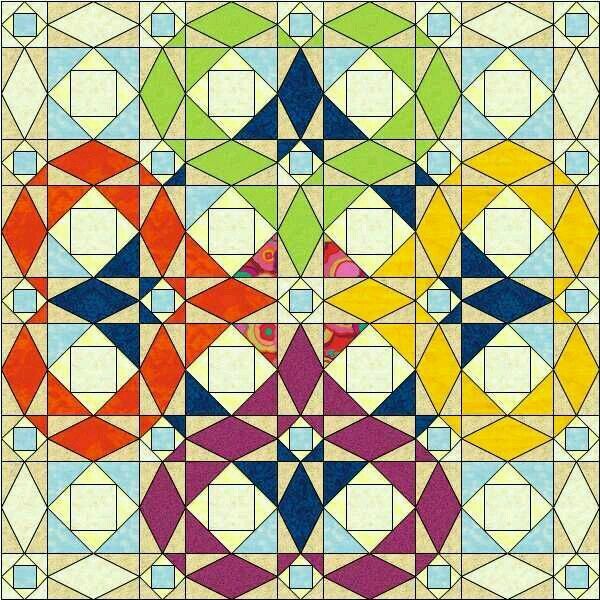 If I were a sane quilter I might like to make one of these! Have a look at the post found HERE for lots of information (and a diagram) for making the Storm At Sea pattern. - And further on quilts that make my heart go pitter-pat, have a look at THIS! - You know how sometimes you stumble on something and you wonder why on earth you didn't think of it yourself? THIS is one of those things!! Your quote for today..."Sometimes when you're in a dark place, you think you've been buries, but you've actually been planted"
I have been stitching on my latest barn but taking a photo at this point wouldn't show you much more than you saw the last time. The stitching involves mainly highlighting, so difficult to see on its own. They both measure about 4" tall. The brown one is from Pier 1 Imports so is quite modern (reminds me of those brown Betty teapots) and the other is labeled 'Churchhill England'. No idea of the age of it because I think I picked it up at a yard sale. - THIS would be really handy to take if you were stitching away from home. - For those of you who appreciate classic looking knits, perhaps you might like to make THIS sweater. - THIS is one of those things that I can't imagine making, but it certainly would be a showpiece! - My last post included a link to making snippet rolls, and I've since found THIS different take on them. 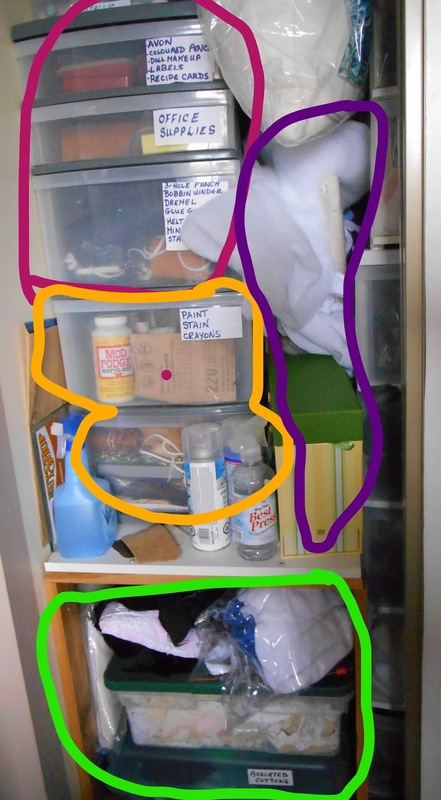 - There are a whole lot of interesting organizational ideas for your crafting space HERE. - For the quilter trying to use up scraps, perhaps THIS might be a fun one to do? - THIS cross stitch pattern made me laugh - and reminded me of all the books currently residing under our bed waiting to be read. Your quote for today: "Four things you cannot recover: the stone after the throw; the word after it is said; the occasion after it is missed, and the time after it's gone"
This is the final post in the cup and saucer 'series' I've been doing. As I mentioned before, my collection is small!! you realize the pattern is on the inside. bottom - no other identifying marks. This one is from my mother's collection. which I have now inherited. and has since been discontinued. 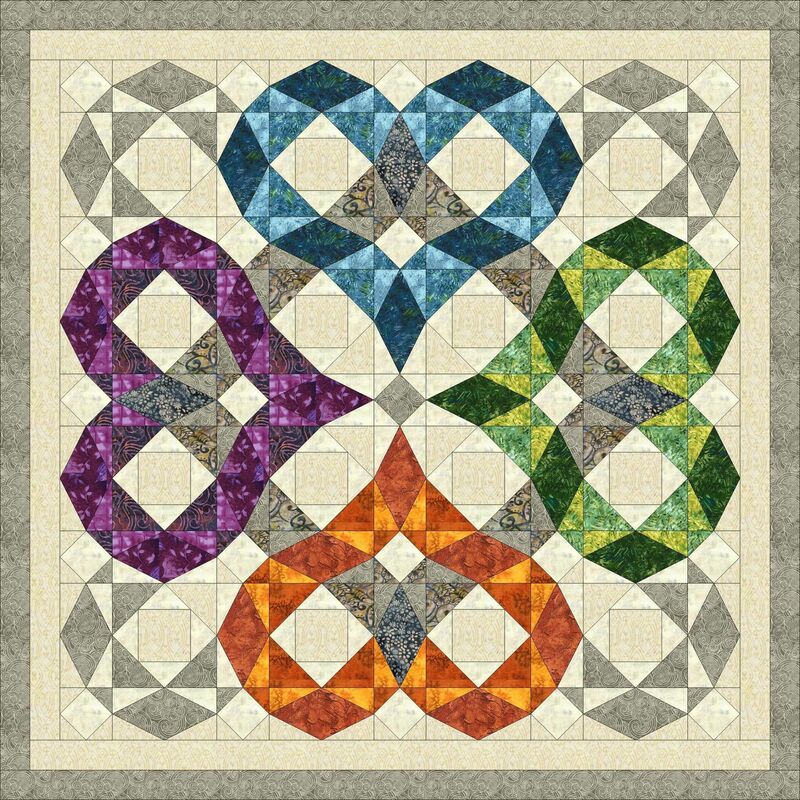 - I'm sure you will enjoy scrolling through the amazing pictorial quilts found HERE (might take a few seconds for it to load). And there are more HERE. - If you are a quilter, you will find lots (!) of links HERE to all sorts of free patterns. - For those that like to work with paper, there's a tutorial HERE for making your own junk journal (using junk paper!). - Many of you know that I like denim, so of course I would find the work that THIS artist does amazing. - There's a cute bee-themed pincushion tutorial HERE. - I did one of THESE several years ago but mine was a needle case. This one is a different take on it. (If you want to see mine, it's HERE). Another anonymous quote..."A strong person is not the one who doesn't cry. A strong person is the one who cries and sheds tears for a moment, then gets up and fights again"
Because precious little has been happening on the stitching front, I thought I'd do as someone asked and post a few more pictures of my small cup & saucer collection. I don't ever use them, preferring to have my tea and coffee in a mug, but I like to see them sitting in my china cabinet anyway! 'Castle - Hand Painted - Japan'. The inside of the cup is mother-of-pearl. This one also belonged to my grandmother. - You have to go and look at THIS!!!!! Kim does the most amazing things with previously unloved pieces of embroidery and this is her latest creation. This belongs in an art gallery!!! Be sure to scroll down to see all the photos. - There's a tutorial HERE to make a very sweet little apron from vintage linens. - Go HERE if you'd like to make a really cute child's apron! - For those of you who use clear stamps for your projects, perhaps THIS idea for storage might be something you'd like to do. - For those of you who garden, perhaps you might find some interesting ideas HERE to beautify your own space. If you click on each of the pictures it should take you to further information for each. Another quote from 'Anonymous'..."Make a list of things that make you happy. Make a list of things you do every day. Compare the lists. Adjust accordingly"
Over the weekend I started working on another barn landscape. It doesn't look like much as yet, but thought I'd show you anyway. Here's the recipe - just in case you'd like to make some too! Combine cucumbers, onions, green pepper & 2 T. salt. Cover with crushed ice and mix well. Refrigerate for 8 hours. Drain, rinse and drain again. In large saucepan, combine sugar, vinegar, celery seed and remaining salt. Bring to a boil & cook and stir for one minute. Spoon over cucumbers. Pour into jars, leaving 1/2" headspace. Cool. Top with lids and freeze for up to 6 weeks. *NOTE: DH uses English cucumbers. - There's a link HERE to a really sweet crocheted baby dress. - And if you happen to like teddy bears, how about a pattern for THIS cutie? - Scroll down when you go to THIS link to see some really sweet ideas for making mini gardens in teacups. - Have a look at the gallery of wonderful quilts HERE. - THIS is a great way to use a lot of buttons! I wonder if, instead of inserting glass, you could pour resin over them.....hmmm. And HERE are a number of other ideas to use buttons (be sure to have a good look at the last one!). Ooops - error correction from yesterday (blame mental-pause for this one!) 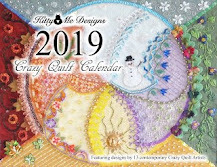 - I told you that the new issue of "Crazy Quilt Quarterly' contained my how to for making a crazy quilted window valance. That was in the PREVIOUS issue!! 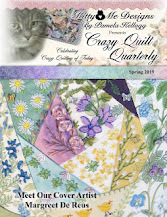 The new issue has my crazy quilted butterfly project. As I said - oops. I told you yesterday that I had a post planned but the weather was dull and pictures wouldn't be great. Well - it's still dull (warm though!) so I decided to do it anyway. A friend and I were into a discussion recently about crafting supply storage solutions for small spaces. Many of you know that we live in an apartment and my sewing space is the second (and small!) bedroom, which also serves as a guest room when needed as well as housing my computer desk. I have managed, through trial and error, to stuff a large amount of stash into this room so I thought I'd share what I did with the closet. It's your typical closet - with double sliding doors, one shelf and a rod. I removed the rod and left the shelf in place. This is the upper right side. 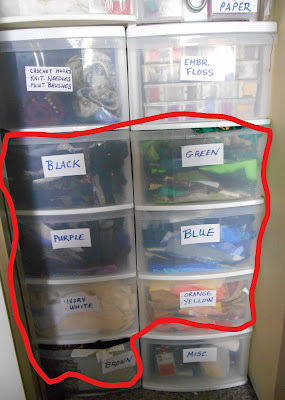 The red circled area contains plastic (dollar store) shoe boxes filled with all sorts of crafting supplies.....threads, ribbons, assorted embellishments for crazy quilting. Below that I have stacked a three-drawer plastic unit (on the left) and two more, smaller in depth, three-drawer plastic units on the right. The green circled drawers hold various types of fabric trims and my hankie/doily collection. On the right are more sewing supplies, along with some of the papers I use for various things. There's a plastic 'box' on the right that holds my paper ephemera. This is the lower right side made up of two five-drawer plastic units. 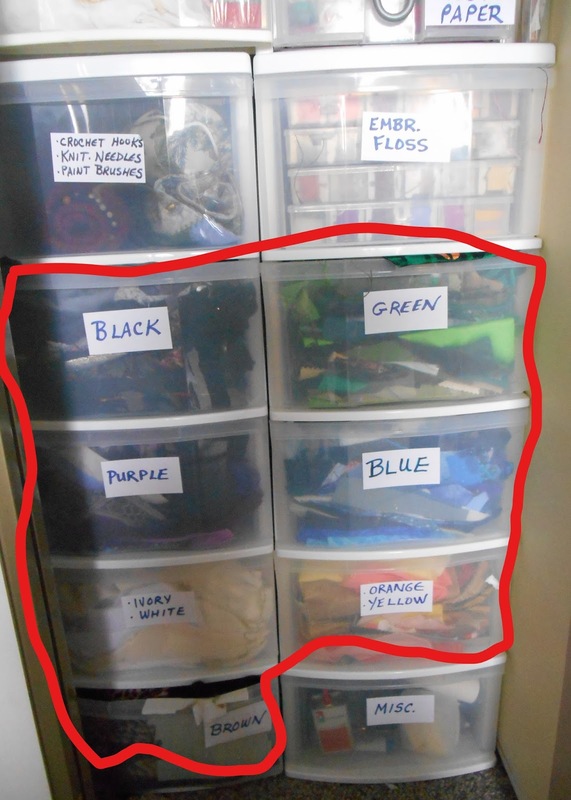 The red circled area are my fabrics for crazy quilting (along with the pink red drawer in the first picture)...sorted into colour families. The top two drawers - one holds my containers of embroidery flosses, sorted according to colour families and, on the other side, my knitting needles, crochet hooks & paint brushes. The Misc. drawer on the bottom holds a lot of 'stuff' that doesn't fit anywhere else. This is on the upper left side. The blue circled bag holds my crochet cottons (using one of those zippered plastic bags that sheets often come in)....the red circled bag holds some misc. 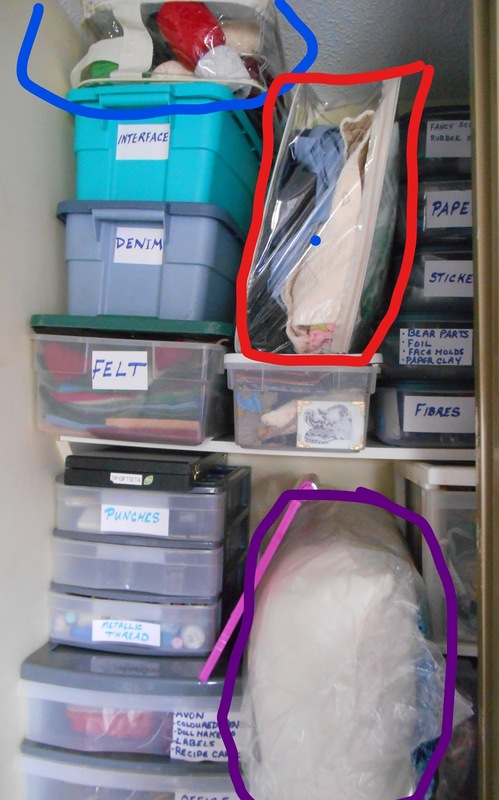 fabrics; and the purple circled area is a bag of stuffing for toy making. Three plastic bins hold my interfacing, denim and felt. Below that there's another small three-drawer plastic unit that holds my paper punches and metallic threads for sewing. And here is the lower left side. The red circled area is primarily things that fall under the 'office supplies' heading. The yellow circle highlights another plastic drawer unit that has my folk art/water colour paints (top) and beneath that is a drawer that I call my 'component' drawer. It holds all sorts of 'stuff' that can (maybe) be used for crafting. It includes some techniques and things that I've tried and not liked, but have kept in case they can be re-worked at some point. 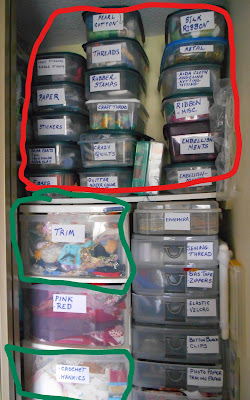 The green circled area holds two larger plastic 'suitcases' - the bottom one holds assorted cotton fabrics that fall under the 'yardage' category and the top one holds my lace fabrics. The 'blob' of stuff above that is just some miscellaneous 'stuff' that doesn't fit anywhere else. Someday I'll pick up another suitcase to hold those. The purple circled section holds a quilt bat and the yellow/green box you can see holds a selection of greeting cards. Well, there you have it. Storage.....According to Magpie. This system works for me and I have a LOT of stuff stashed into what basically isn't a very large closet. Of course I have other crafting supplies in other units elsewhere in my room, but this is the basic 'guts' of my storage. - There's an interesting article HERE about natural dyeing using things from your supermarket. And if you have a look HERE there are some comparisons with using leaves. And if you'd like to try dyeing with Kool-Aid, there's a tutorial HERE. I'll leave you with just those mumblings for today because this post is quite long enough. For the quote, it's another anonymous one..."Just because some people are fueled by drama doesn't mean you have to attend the performance"
Since my back is still being 'tricky', I don't have anything of the creative nature to share with you. On top of that, the post I had planned can't happen because I need decent light to get pictures. Hopefully tomorrow?! So....you know what happens when....a) I have nothing else and b) I have an over-abundance of mumblings saved up to share! 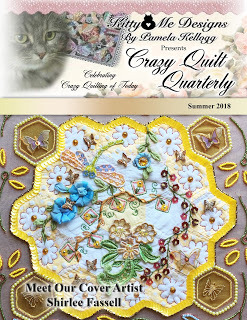 The newest issue of the 'Crazy Quilt Quarterly' magazine is now available! As always, there's lots of eye candy, how to's and articles for you to delight over. You can get your copy simply by going to either THIS link (for MagCoud) or THIS one (for Etsy). You can find my article in this issue for how to make a crazy quilted butterfly wallhanging. - If you're searching for an idea for a graduation gift, how about THIS? - I really like THESE crocheted poppies - and the pattern is free! - Not that I have any plans to get involved in any sort of vending at a craft show, but I did find a few of THESE ideas intriguing. I'd actually like #8 to store my necklaces if I had the space! - I don't often point you towards commercial ventures, but this one caught my eye. Vickie Howell (of knitting fame) has announced her new monthly subscription yarn-y goodness box program. You can find out more HERE. 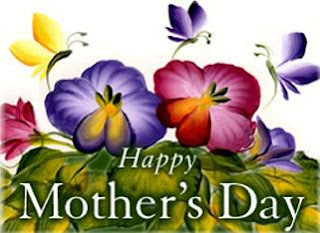 If you're searching for a Mother's Day or special gift for a knitter perhaps you'd like to check it out! - If you happen to like those Altoid candies and have a collection of the wonderful little tins they come in, there are a number of great ideas for re-purposing them to be found HERE. - THIS d-i-y mini loom looks rather intriguing. It doesn't look difficult to make and it would be a great way to use scrap yarns. - The same site that has the loom instructions also has THIS really cool looking desk organizer made from copper tubing. - If you're interested in rust dyeing, you might find THIS of interest. - There's a tutorial HERE for doing a crochet cast-on for your knitting projects. Another anonymous quote..."A bad attitude is like a flat tire, you can't get very far until you change it"